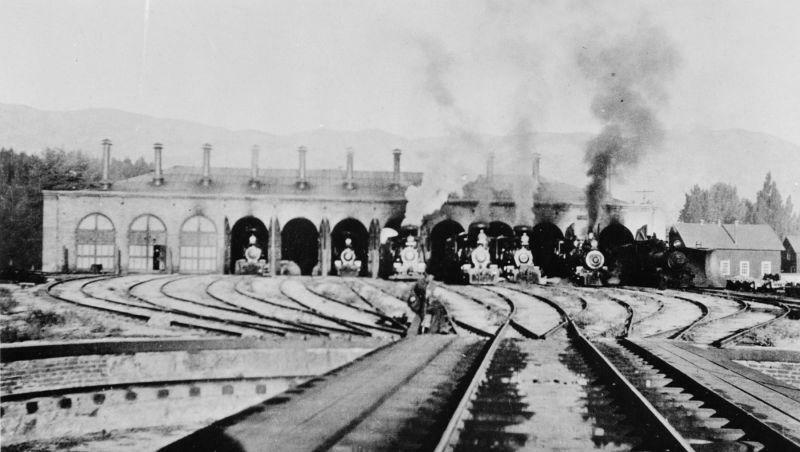 The Virginia and Truckee Railroad began operations in 1869, hauling gold, silver, timber and passengers back and forth between Carson City and the Virginia City. Three years later a line to Reno connected the V&T with the new Transcontinental Railroad and the rest of the country. And at first, the V&T’s engine house and repair shops were located in a small building at the southern end of Virginia City. But by 1872 business was booming, they were adding more locomotives and rolling stock, and a new shop building was necessary. 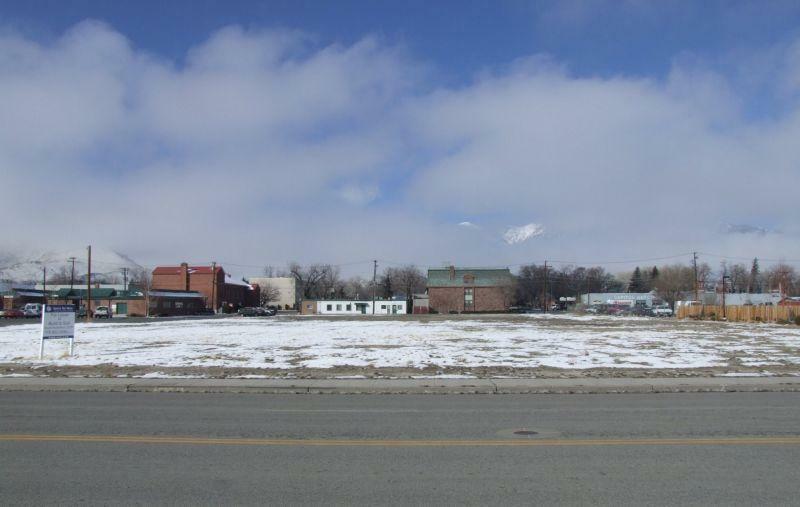 The railroad decided to relocate the new shops to Carson City, and purchased several acres at the north end of town, near the train depot on Washington Street. The new building was ready the next summer, and by February 1874 it was in full operation. The V&T shops were impressive; the horseshoe-shaped main structure was roughly 200 by 300 feet, and built out of the same native sandstone as the Capitol, the Mint, and other buildings around town. Abraham Curry himself supervised construction, and when it was completed there were 11 full-size bays where a locomotive could be brought in for repairs or maintenance. The building also housed an iron foundry and fabrication shop that built machinery not only for the railroad, but for other businesses in the area. Church bells and flagpoles were just some of the items constructed here along with railroad parts. As the years went on mining activity decreased on the Comstock, and the V&T moved on to hauling passengers and agricultural freight to stay viable, even opening a line to Douglas County. But as the railroad declined and sold off its engines, the shops were needed less and less. This picture was taken in 1939, right around the time service to Virginia City stopped. There are seven engines here, which was probably the entire roster of the V&T at the time. The paint shops and foundry had already been closed down, and parts of the building were falling into disuse. The Virginia and Truckee was a dying railroad. The railroad was dying, but it was not dead yet. Service to Virginia City may have stopped in 1939, but the railroad still ran daily routes to Minden and Reno. It wasn’t until 1950 that the line was finally shut down and the last of the equipment sold. The rails were pulled up soon after, and the shop building shuttered. The building was already in deteriorating shape in 1950, and being abandoned didn’t help any. Over the next few decades neglect set in, the roof caved in, the doors rusted, and wild animals took up residence. By the 1980s the building was seen as a public hazard, and although there was interest from preservationists to save it, nobody was coming forward with any money to do the necessary renovations. In the late 1980s time finally ran out for the old V&T shops. The building was torn down, dismantled brick by brick. The sandstone blocks were sent to Napa Valley to build a winery. The land they sat on, two full city blocks now surrounded by hotels and shopping, was put up for sale. And now it’s 2006, nearly 20 years after the shops were torn down. Looking out over the place where the V&T shops used to stand, we see nothing. The land has never been developed or built on. It’s not even used as a parking lot. Maybe it’s cursed land, or maybe no developer has seen any potential in the site. But whatever the reason, this historic site remains nothing more than an empty lot in the middle of town. Next The Freeway Is Open! Sir – do you know which winery purchased the quarried stone? Just curious. I had “unofficial” access to the building as a youngster and explored it thoroughly and have an attachment to it. Carson City blew a great opportunity to restore something of historical significance to the area. Can you imagine that building as the rail museum with doors open, engines steamed up and out facing Stewart Street? Sad. Stumbled across this page. Wonderful information. I must admit, I’m more than a little jealous of someone being able to explore the old engine house prior to its demise. I now live only a few hundred feet from the V&T mainline and the C&C start. And I get to hear the whistle of the steam engine just as it was a hundred years ago. Sad. The main middle section of the structure was caved in, and behind the shot you put in, was once the severed remains of a small burnt engine shed with Baldwin #26, burning inside after the schedule was made for the final run. The oil under the pit was lit by still burning ashes from the day’s work. Now, no longer being any remains, the legend still lives on. I lived in Carson for over 40 years and was at the City Counsel meeting that tried to save the building. The owner of the property sought a permit to level the building as it was a hazard and he wanted to move on and build on the property. The city offered to pay for his insurance premiums but he refused. The hand cut blocks were marked and shrink wrapped when the owner took them down and as far as I know, were set out in the desert somewhere. The city had no way to stop the owner from leveling the property despite it historical significance but they did have one card up its sleeve. The V&T shops polluted the land with mercury, asbestos, oils, lead paint and other heavy metals during its heyday. The state slapped an EPA cleanup requirement on the property! No one wants to build on it as it will require millions to clean it up and remove the soil before construction could begin.